Looking for a book during break? Wow! Where has the semester gone?! It feels like just yesterday that I moved in and got ready for my first semester. Time seems to fly by pretty fast the older we get and as such we lose time to do the things we enjoy doing. I know that for me I have found less time to do the one thing I like the most- reading. I have always loved to sit down on a rainy day and delve into the world of my current favorite author. I could lose myself for hours in C.S. Lewis’ mythical lands and Jane Austen’s romances. But now all my time is taken up with homework, studying, and hanging out with friends. Don’t get me wrong I like being able to do productive things but reading gives you chance to step out of your world and into someone else’s. Reading provides an opportunity for you to expand your worldview and at the same time, enjoy the expansion. When I first started working here at the library, I was amazed at all the books I saw. I was in heaven! (Or something relatively close.) And when I found out that the Juvenile section had books I had loved reading when I was homeschooled, I had a hard time containing my excitement. One particular afternoon I remember shelving some books in the Juvenile section and I came across a book that my mom had read to my siblings and me when we were kids. I remember this book all too well because it was a mind game book that I didn’t understand as a child. So I decided to re-read the book and see if I could figure it out. 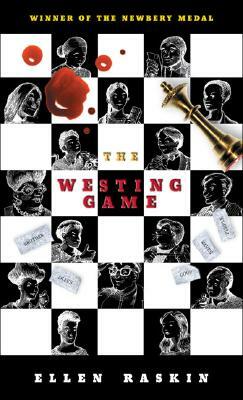 The book, The Westing Game by Ellen Raskin, is a story about a rich business owner who is found dead in his estate. In his will he invites a seemingly random collection of people to a game of whodunit. The prize is his mass fortune. Each person is paired up with another “heir” and the couple is given a set of clues that is supposed to help them figure out who murdered the rich man. This book is filled with laughable drama and dialogue, mind bending twists and turns, and even a few explosions! I invite all of you to join in the madness to figure out who murdered Mr. Westing and why over Christmas break. It is a short and enjoyable read that allows you to expand your mind without hurting it too much! It can be found in the Juvenile section under PZ7.R375 Wes 1997. Have a great break and Merry Christmas! oh, i love that book!